I had breakfast this morning at the Undertow Bar on St Pete Beach before heading down to the Gulf Beaches Museum. It was a rainy, overcast day. Not your typical Florida beach morning in Paradise...but it still beats the best day out in someplace like western Arizona. Although it was 9:30am, the Undertow was almost deserted. A young couple was having breakfast at the edge of the patio and an attractive woman in a sundress was reading the sports page a few tables away. The breeze was much cooler than normal at this time of year because of the continual rain this week. In the evening, this place is packed with the 22-35 age group...but this morning, there was nothing but quiet. I was able to walk through the main bar and see how nice the inside looked when it is uncrowded. One of the waitresses told me the girls and guys who work the evening shift (they rotate weekly) have to scrub the bar, the patio, and the order area with stiff brush brooms and bleach/disinfectant. They cannot leave until there is NO sand showing anywhere. My level of respect for cleanliness went up immediately. I never knew there was that exacting level of accountability in a St Pete Beach bar. Impressive. The waitresses joke that they make great tips on the evening shift, but they earn that money all over again by working so hard to scrub and clean the entire site before they can leave. 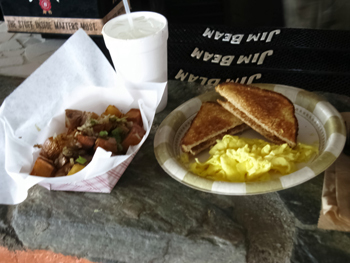 The Undertow Bar not only provided a relaxing setting to enjoy the morning on St Pete Beach , it also produced an extremely filling breakfast. As you know, I am real basic when it comes to the first meal of the day. No matter where I eat, it is pretty much the same...two scrambled eggs, grits and some kind of wheat or multi-grain toast. Since the menu did not include grits, I ordered potatoes. Let me tell you, they dressed those up in chopped bell peppers and onions...some kind of excellent seasoning...and enough fried potatoes to gain 5 lbs. That basket was a meal in itself. The menu at the Undertow Bar is in no way extensive like you'd find at Gators Cafe on Treasure Island or Britts Laguna Grill up on Clearwater Beach. The breakfast menu is all a la carte, and consists of cold cereal, bagels, hot cakes, French toast, eggs, and a 3-egg omelet. Sides such bacon, sausage, avocado...and potatoes several different ways are all paid separately... and average about $1.50 apiece. My entire breakfast was only $5.25, plus tax...but that boat load of potatoes was unnecessary. I was stuffed all the way until dinner at 6:00pm. The 3-egg omelet (4 different styles) is the most expensive item on the menu, but it's only a little over $5 dollars. 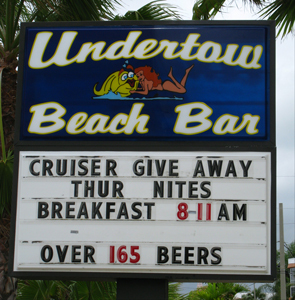 If you want to spend an easy morning for breakfast on St Pete Beach, head over to the Undertow Bar . I think you will enjoy the pleasantness and the meal. 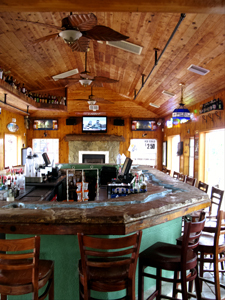 Want to know more about St Pete Beach Bars? Interested in the St Pete Beach Nightlife?